Now relocated to the trading estate on Manor Lane, the original site of this long-established business was in the village centre: it is now occupied by Costa and Sainsburys. By 1850 Thomas Morrey was working as a cooper. He was followed by his sons: William carried on the barrel making and Arthur started a drapery, reputedly in the basement. What had been Forshaw’s gas showroom was absorbed into Morreys, becoming the paint shop. Apart from paint, here you could buy paraffin for the domestic heater. It was pumped from a can kept at the back of the shop. At the north end, what had been Plant’s saddlery became the gentleman’s outfitter department of Morreys, run by Len Tallon. Len neatly wrapped every purchase into a brown paper parcel tied with string. In the era of David Morrey the upstairs gradually became the bike showroom and the top storey was used as a store. The stock of electric lamps, being light weight, was kept at the furthest extremity deep into the attic, through a series of small rooms. There was an office at the back of the shop where Mrs Thomas calculated the wages on her hand cranked calculator. Behind this was a bike repair shop. In the 1950s Morreys had a branch in Middlewich, run at one time by Albert Rathbone. There it was possible to buy a small amount of paint tipped out of a full can! 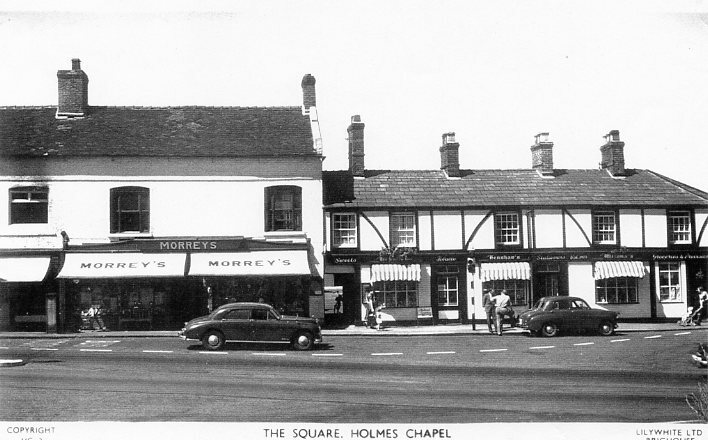 Morreys is the oldest surviving family business in the village and from 1850 until the move to Manor Lane was always partly staffed by members of the family.